In a world where “fine” is the standard answer as to how one is doing, Stephen’s book is refreshingly open, honest, and real. In his wonderful book, “101 – A Marriage & Family Success Story,” Stephen speaks of God’s faithfulness and restorative power even in the midst of separation and divorce. Even though God hates divorce (Malachi 2:16), it does not scare Him or limit His miracle working power in any way. Although Stephen and Cynthia had been divorced for eight years, God was able to keep them abstinent (a miracle in and of itself), and restore their marriage so that they were remarried. This book is a testimony to the love and power of God to work in our lives regardless of our circumstances. God is not a respecter of persons (Acts 10:34). In other words, He does not play favorites. What He did in Stephen and Cynthia’s lives, He can do in yours. All-in-all, “101 – A Marriage & Family Success Story” is a great short read and I highly recommend it to anyone who needs victory and hope for their marriage. Thank you for the myriad of miracles that you perform everyday in our lives – You give life and breath to all mankind. Thank you for the way that you have worked mightily in Stephen’s life and in his family. My prayer is that you would have mercy on everyone who reads this review, and if they are willing to humble themselves and seek (ask) you according to your will, please give them the miracles that they so desire. I would love to hear from you! If God has restored your marriage, please leave a comment below. How did He accomplish this? What steps did He require you to take (if any)? I want to start by saying that my heart goes out to the families of everyone who was killed, maimed, or otherwise hurt in any way as a result of this horrific act of terrorism. I have been praying and will continue to pray for you. Disclaimer: This post is not meant to rationalize, excuse, or otherwise dismiss the awful acts of terrorism that were committed. It is only an attempt to provide a line of thinking from a Christian perspective that may have been largely overlooked. 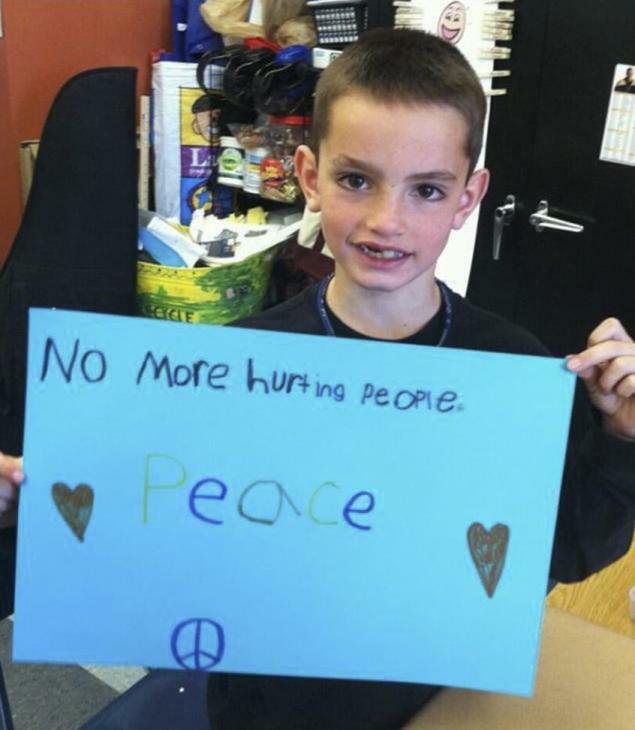 Boston Marathon bombing victim Martin Richard, 8, held a call for peace at a school event last year. He ended up dying a victim of terrorism. Why was that? Was it because he failed to reach out to other Americans and to offer himself friendly? Or was it because we American’s failed to reach out to him and to offer ourselves friendly, perhaps because of our prejudices against foreigners? I suspect it was probably a combination of the two. What does the Bible say about how we should treat foreigners? Let’s take a look at some of the scripture. For the Lord your God is God of gods and Lord of lords, the great, mighty, and awesome God who is unbiased and takes no bribe, who justly treats the orphan and widow, and who loves resident foreigners, giving them food and clothing. So you must love the resident foreigner because you were foreigners in the land of Egypt. The above scripture says that we as Christians are supposed to love foreigners as ourselves, give them food and clothing, and that we should not wrong, oppress, exploit, or mistreat them. I’m as guilty of this as the next person. Perhaps I don’t reach out to foreigners as much as I should because of the natural barriers: linguistic, religious, cultural, and etc. Or perhaps I wasn’t aware of the scripture that speaks to this (I can’t have this excuse now!). Whatever the reason, let us push past these barriers and reach out to the foreigners in our country in love, because, who knows, perhaps we can help prevent the next terrorist attack by doing this. Please forgive us for our prejudices and other wrong thoughts and feelings toward foreigners. Please help us to see them as You do, as human beings that You love just as much as You love us. Help us to remember that our ancestors were once foreigners in the land of Egypt. Most of all, help us to remember that is it Your will for us to love foreigners as we love ourselves. I would love to hear from you. Please post a comment below and I will respond to as many as I can.